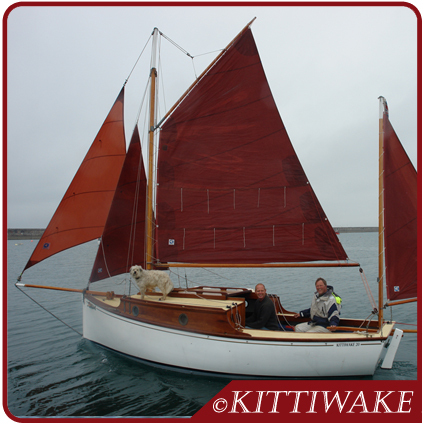 Below the waterline is the traditional long keel, giving 2ft draft at the bow, and 3'4" at the heel. Ballast is 1200kgs of iron, cast in cement, laid internally and giving a ballast ratio of nearly 60%. This shape of keel is also ideal for trailer launch and recovery, and for taking the ground in combination with the beaching legs. The bowsprit and bumpkin are both fully retractable, reducing the LOA from 32ft down to just 21ft, keeping down marina costs. The sail plan is a gaff yawl cutter, well balanced and easy to sail, with all sail trim done from the cockpit. The main mast is hinged in an oak tabernacle, allowing rigging to be done single-handedly. The large and comfortable cockpit gives adequate seating for about six adults, with the dining table doubling up as the cockpit table. There are three good sized lockers, plus a gas locker. There is also plenty of stowage under the side decks. 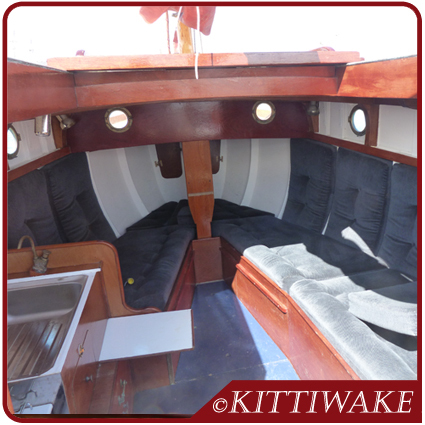 Inside the full width cabin is a decent sized galley, with double burner cooker and grill, and a sink with drainer. Underneath this are cupboards, and there is a fold-down lid above, converting the galley to a chart-table with overhead spotlights. The three 6.5ft berths are arranged with two running forward either side of the compression post, and the third running aft to a quarter berth on the starboard side. There is also a choice of having a double across the cabin. Underneath the berths is easily accessible stowage space for clothing. At the aft end of the cabin is the step/seat box which also houses the toilet. The cabin structure is all wood, with mahogany front and sides, and marine ply decking supported by hemlock beams and knees, all of which are sheathed in epoxy. The enormous sliding hatch opens up half the cabin roof, enabling standing whilst cooking. At the forward end of the cabin is the anchor locker, accessed through two doors. the anchor chain is fed down through a hawse pipe. There is 150ltrs of water carried in two flexible tanks, one under the chain locker and the other under the quarter berth, both being connected to the sink tap. The 13.5hp Beta Marine twin diesel is housed between the cockpit and cabin, and is easily accessed via a hinged step and lid. The 25ltr diesel tank and battery are housed on the port side forward locker. 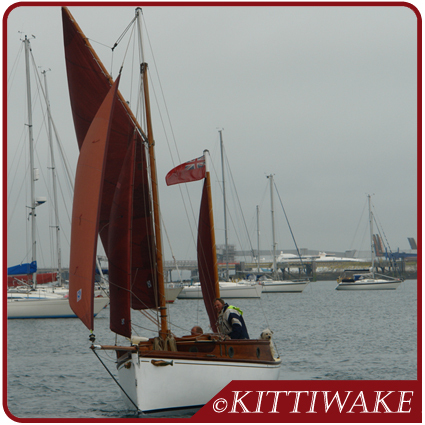 The Kittiwake 20, although weighing about 2 tons, may be trailed behind a Land Rover type vehicle. With the specially designed four-wheeled trailer, which is fitted with greaseable hubs and brake cable, keel guides and docking arms, launch and recovery is easy on a proper slipway.